Idaho Mountain Builders is benchmarking home efficiency for increased value and sustainability. Expansive, stunning, luxury residences are a mainstay in the Sun Valley resort area — the average home in unincorporated Blaine County is 4,700- square- feet; twice the size of the national average. However stunning the design and thoughtful the architecture these out-sized dimensions ensure that our community has a similarly out-sized energy, water and carbon foot-print. In this time of ever increasing energy costs and an over-taxed water table, properties of every dimension will surely diminish in value as their relative operating costs increase. Communities across America are addressing these issues at a governmental and individual level. Local governments are enacting Property Assessed Clean Energy (PACE) financing programs, whereby residential and commercial energy efficiency retrofits are being financed through a municipal loan and are repaid through property taxes over 15 or 20 years. None of the local taxing authorities in the Wood River Valley have implemented such an initiative. Fortunately, out of adversity springs ingenuity. The Wood River Valley is home to a small group of architects and builders who have recognized that cutting-edge home assessment techniques, when coupled with energy efficient systems and green building products, can significantly improve home efficiency without compromising aesthetics. The advent of the clean and green building movement doesn’t mean that local home-owners can no longer enjoy the features – expansive windows, high ceilings, luxurious space – that are the hallmarks of the Sun Valley lifestyle. Nor does it mean that energy efficiency is the privilege of future custom builders. On the contrary, cost-effective energy efficiency projects can be undertaken in almost any circumstances and on any scale. Whether a simple initiative, such as replacing drafty windows with an energy efficient product or a complex undertaking like implementing a cutting-edge networked home management system, these solutions offer value that can be economically quantified, justified and, even in this credit environment, privately financed. 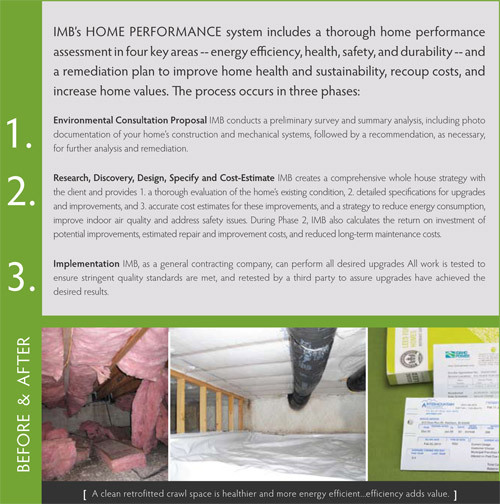 Idaho Mountain Builders™ collaborated with Hailey-based energy and environmental consultants Vital SPEC, inc. in creating theHome Performance (HP) system™ to specifically address the issues of energy efficiency and sustainability. IMB has recognized the inherent rationality of most home-owners; homeowners will invest in home energy efficiency if there is demonstrable value in terms of monthly operating costs and improved property value. IMB can define that value. “Intermountain Gas records alone show that gas use is five times higher in the Wood River Valley than in other Idaho communities, a trend that extends to the use of other resources, such as water,” explains IMB co-founder Tim Carter. “We developed Home Performance system to help people alleviate financial and environmental costs while preserving aesthetics and increasing home value, safety and sustainability.” IMB is a locally-owned custom home builder and home efficiency expert at the forefront of the regional green building movement. Carter and IMB co-founder Joe Marx have been building locally since the 1990s before establishing IMB in 2005. In 2008, IMB integrated superior craftsmanship and aesthetics with state-of-the- art sustainable systems and products to design and build the first single-family residence in Ketchum (410 River Run in Warm Springs) to achieve the Green Building Council’s “Leadership in Energy and Environmental Design Award (LEED).” Carter and Marx are Energy Star certified builders, members of the U.S. Green Building Council, and are appointees on the BuildSmart Technical Advisory Committee providing green building recommendations to Blaine County Commissioners. Committed to assembling the best team possible, IMB maintains strategic relationships with top-tier architects, sub-contractors and system specialists to complement its expertise and to better serve its clients. 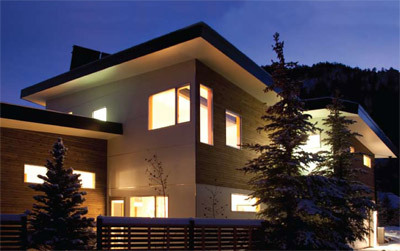 When designing and building the first LEED certified home in Ketchum, IMB and its construction team attained the rigorous LEED and Energy Star designations, and employed testing and analytical methods to design and monitor the home’s performance. Since then, IMB and its network of partners have collaborated on several projects.